After many months of meetings, debate and drafting, the Wireless Code has finally reached its final form and was published by the CRTC this morning. The code will apply only to new contracts for cellphones and other personal devices, starting December 2, 2013. The new wireless code applies to all wireless industry players and finally brings the highly anticipated end to three-year contracts: it allows individuals and small business consumers to terminate their contracts after two years without paying cancellation fees, even if they have signed for a longer term. “Every day, Canadians rely on wireless devices while in their homes, at their jobs, at school or travelling abroad,” said Jean-Pierre Blais, Chairman of the CRTC. “The wireless code will contribute to a more dynamic marketplace by making it possible for Canadians to discuss their needs with service providers at least every two years. The wireless code is a tool that will empower consumers and help them make informed choices about the service options that best meet their needs. To make the most of this tool, consumers also have a responsibility to educate themselves,” Mr. Blais added. Also, the wireless code aims to address bill shock for roaming charges — remember that $22,000 bill – so, under the new rule, individuals and small business consumers will be not only be able to cap international data charges at $100 month, but also to cap data charges at $50 per month. The aim of the Wireless Code was to protect mobile subscribers, as when it comes into effect on December 2, 2013, it will establish basic rights for all wireless consumers and puts new requirements on service providers. 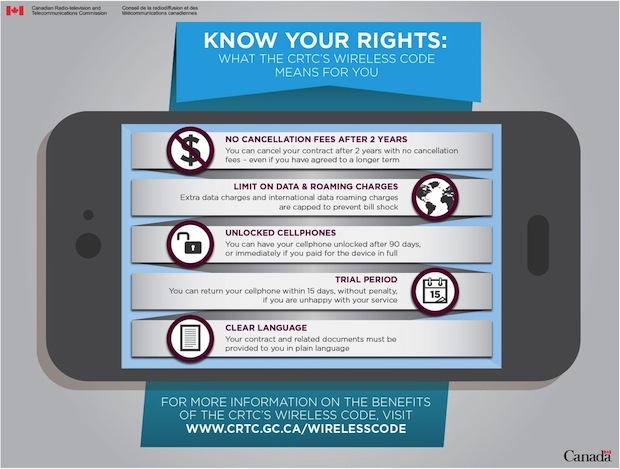 You can read the Wireless Code as published on CRTC’s website. The agency has also prepared a checklist to explain your rights as a wireless subscriber.